Good afternoon everyone, hope you are well :-) I am here with a thank you card I made for my crafty ribbons team mate Laura who was very kind and sent me a card when I was having a hard time :-) I used an image of a vintage typewriter and a message which I shaped and placed on 3D foam to give proper dimension from the paper. I used Papermania and Tim Holtz papers, DCWV metallic cardstock, Rose ribbons from Crafty Ribbons, lace, a key charm and a wooden heart which I threaded with pink bakers twine. Good morning everyone, hope you are well :-) I am here with my midway inspiration post for our 'Celebrate' challenge at A little bit Crafty. We were given lovely blooms to use from Petal Lu so I used the new Papermania capsule collection papers and ribbon which goes with this well :-) I used an image from the graphics fairy, then decorated it with a 3D butterfly from the Madame Payraud collection also by Papermania. We have some fabulous sponsors so please pop by and get involved! All Crafts Challenge Midway Inspiration! Good morning everyone, hope you are well! 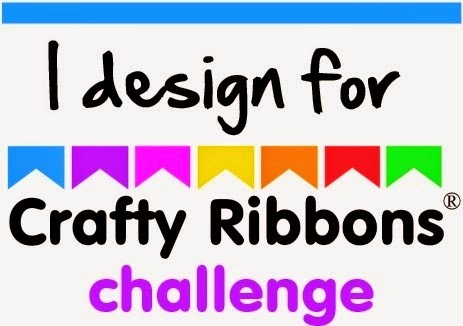 Well its time for our midway inspiration for our All Crafts challenge, anything but a card (post is here) and hopefully youll love all the fabulous creations my team have come up with! :-) Mrs A. Good afternoon everyone, how are you? I am here with my project for Sarah Hurley 365 where our theme this time is 'Thank you'. I chose an image from Expedition, one of my favourites, and papers from Steampunk :-) I added a sentiment I created with a frame on a graphics program and printed it out. I used bronze card as my mat for my image and sentiment. I decorated using Jute ribbon and stripe buttons. Good evening everyone :-) First of all Happy New Year! Hope this year is fabulous for all of you :-) I found out which of my cards won the 3rd place in Cardmaker of the year 2013, I havent blogged it yet as I was focusing on christmas so I thought I would share it with you :-) I used Stampin' Up Patio Party papers, inks and cardstock, with stamps from stampin up too. I shadow stamped my image and sentiment first-the lighter colour below the darker blue makes the image really pop. I then die cut these with spellbinders dies. I echoed the shadow stamping with the mats I used-placing the yellow and blues slightly off centre of each other. I made my sketch with the papers then placed my image an sentiment.